It was midnight, I couldn’t sleep, and cleaning out my closet seemed like a very good idea for what to do with myself. At the back of the closet, I found a set of framed photos, silk-screened prints and paintings that had never made it onto the walls of our home – and I also found an alphabet-themed sewing sampler, completed by me at the age of eight. Picking it up and dusting it off with a soft cloth, I marveled at the different colors of each of the letters of the alphabet – brought to life through embroidery floss across a rainbow spectrum. I don’t recall my reaction, but there I was, minutes later, sitting in the bright yellow flowered chair, freshly-pressed sampler cloth clicked into the embroidery hoop, needle at the ready. All of this came flooding back to me, now a 43 year-old adult in a mango-colored room in the middle of the night, just 12 miles away from my childhood home. Wrapping a blanket around my shoulders in the chilly New England winter, I plopped down into a comfy chair and stared at this window to my childhood. I began to remember sewing one letter per day, while my Mum quizzed me on vocabulary words starting with that very same letter. While I later bombed my standardized math tests, I aced the vocabulary one. I also remembered her reading to me from Vladimir Nabokov‘s Speak, Memory! in which Nabokov relates with great zest his childhood conversations with his mother about how the colors of the alphabet on his wooden blocks were just, well, all wrong. We read that section of the book over and over again, debating the colors of the alphabet – before choosing the color of the embroidery floss to be used on the next letter in the sampler, the next day. Noticing that my cold toes were calling me with ping-y chills, I curled my legs underneath me on the pillowy chair, and as I shifted my weight, all of a sudden I saw it, the letter Q. There it was, that letter Q, sewn in a burgundy to coral spectrum-toned embroidery floss, perhaps a queenly-choice for color? I can’t remember. But more important than the color, was the shape of the Q itself, plastered to muslin cloth in an eternal unhappy embrace. The shape of the cross-stitches does not belie the grumpiness and anger and resentment that must have coursed through me that day. Short crosses, long crosses, out of the line crosses. 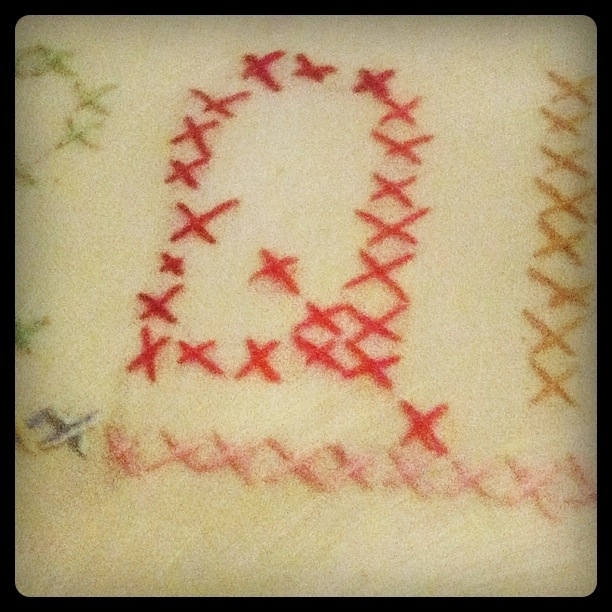 I was clearly not a happy camper when that Q was stitched. Looking at that oppositional Q, I began to remember the arguments that led to my begrudging give-in to sitting and sewing that preceded the alphabet discussions ranging from Wordly Wise vocabulary quiz-books to Nabokov. In retrospect, I am sure Mum was trying to engage me by “starting where I was at,” given that my love of words, etymology and collecting alphabet books had already manifested as a young child. Also, this was also a very l-a-d-y-l-i-k-e way to spend one’s time, something to be encouraged. So, there it sits, the Q that symbolizes the height of my childhood protests against the way things must be – and against the attainment of proper behavior, maintained honor and overall ladylikeness (Kenne, the Karagoz Puppet who is the Queen of Manners and Maintenance of Ladylike Behavior sniffs her disapproval at this moment). But let me start before the moment The Oppositional Q was born and go back to my earlier childhood in New England – not the expected place where a few of the more informal tenets of Islam might be taught during the 1970s. Many Saturday nights were spent sitting by the old stone fireplace with my family, the glowing coals of a perfect fire heating the tips of my toes as the deep blue dusk crept across the windows and up onto the roof in wintertime. We spent so much time sitting in that space, atop one of my parents’ prized Persian carpets. “Only Allah is perfect.” I grew up hearing this phrase from my Father, so it was a familiar one by that point. Now, what is odd about this is the fact that my Father is not a Muslim, nor has he ever lived in or even visited a Muslim country, to my knowledge. I doubt that my Father even knew much about Islam before I met M. and decided to become betrothed to the tall man from Turkey and we all got a little bit more interested in Turkey, the Middle East and Islam. Let me tell you that my Father is an old-school New England Yankee, with frugal Unitarian roots, but somehow, he and my Mum became enthralled with Persian carpets. And it was in the study of Persian carpets (as everything in my parents’ life appeared to involve a passion for learning and studying) that my Father learned the phrase “only Allah is perfect.” And it stuck in what I consider to be the most pure and true of ideal cross-cultural moments that move on to last a lifetime. Apparently, as I have learned from my Father in later years, and later confirmed with a rug salesman during a Turkish translation that M. facilitated, all practicing Muslim rug-makers leave a purposeful imperfection in their artistry when weaving carpets. Presumably an effort to rein in the potential for hubris. Usually, my Father would restate this phrase when something had gone wrong – and I think it was a brilliant way to try to instill a very good message to what must have been a very tense young girl. Example of the kind of embroidery sampler my Granny would have made while growing up in rural Spain - and it would have been per-fect. The phrase was bandied about a lot, as I recall. We were a very imperfect family (and which family is not). The use of this phrase had its limits, though, when it came to my mother. In order to explain this, I have to take you into back into the realm of embroidery. You see, my Granny, a lady of a different era than we might be able to imagine today as coming from our lifetime, had grown up in southern Spain, in the town of Aguilas by the sea. Raised by British nannies in a cool, dark stone house that protected her fair skin from the ravages of the sun, she grew up in the shade of the home’s inner courtyard, making lace and embroidering her trousseau to the sounds of the Mediterranean across the street. Her only schooling outside of the home consisted of a 6-month stint at a girl’s finishing school in Liverpool, England. When I first went to this house in Aguilas in the year 2000, I stood in that courtyard and closed my eyes, listening to the progeny of my Granny’s waves still just on the other side of the courtyard wall, almost 100 years later. I kept expecting to see some errant embroidery, left behind on the garden wall, or on a marble side table. This is a happy girl engaging in some after-school embroidery. This is NOT me as a young lady. Granny, the ultimate lady in every respect, was perfection when it came to sewing, lace-making or embroidery – and she passed this on, perhaps one degree less, to my own Mum. And it was, therefore, a necessity that I too should engage in this activity. The problem was, as I realize now, I hated it. Hated. It. And the other problem was, both my mother and my Granny, they didn’t care that I hated it. Each day after school (or after swimming, in the summer months), they would sit me down for sewing hour. I would rather have been anywhere else – preferably reading, as I recall, up in the tall hemlock tree in back of the house – away from everything and able to spin magical tales in my mind after finishing book after book. When I was done with the books, I would drop them to the hemlock-needle-padded floor below before climbing down again. 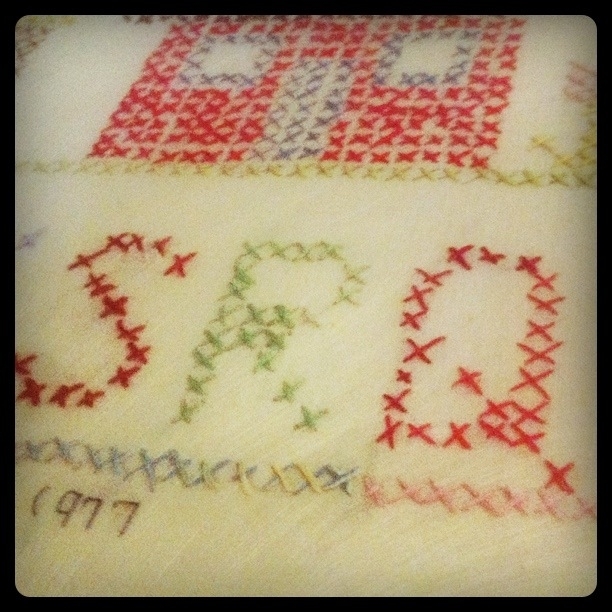 But there I stayed, embroidering, the good girl, boiling inside with resentment and sharp anger like the accidental pricks of pins into my finger tips as I held my embroidery loop. I only mastered the cross-stitch – which sewing enthusiasts will tell you, is the bottom of the barrel. I think my Mum gave up on her efforts to get me to embroider that day, some might say, her efforts to fit a square peg (me) into a round hole (ladylike behavior). The horrible truth is, she finished most of the rest of the sampler for me and we never discussed it again. She had it framed and I have dutifully carried it with me from home to home for the rest of my life, never putting it on my wall. And there it sits, in my closet, the oppositional Q, reminding me now, in my mid-life challenge time, “only Allah is perfect.” I am sure there is a lesson to be found there whenever I need one. This entry was posted in Cross-cultural learning moments, Early exposure to Islam, Visits from the Karagöz puppets and tagged Allah, Craft, Crafts, Embroidery, Embroidery thread, Granny, islam, Letter (alphabet), muslim, Needlework, New England, Parent, Sewing, Vladimir Nabokov. Bookmark the permalink. Puttering around my large back closet the other night – I went from the material into the mental world. No, this was no Narnia-like wardrobe of transportational imagination, if you will, this was stumbling upon an old embroidery sampler I made in 1977 at the tender age of 8. Check out this essay to find out more – and to see some of my early exposure to Muslim culture in the most unexpected of places. Thank you . . as much for the nicely constructed window to a personal corner of one of your ‘rooms’ as for the reminder of why all of the carpets/kilims that J and I have acquired here in Turkey have one thing in common despite their diversity of style and origins – every one was born on a village loom and every one is gloriously imperfect! Thanks, Alan. Been wondering if J. grew up having to do samplers. I have this image of it being a very Brit thing. 🙂 Your village loomed-carpet collections sounds lovely, imperfections and all. Imperfection is the new perfection. Thank you for sharing this fabulous personal reflection and memories! My mom and dad were both also very much fans of Persian carpets. I just love how you’ve woven (pun intended) so many elements into this essay, Liz. And the zinger of your retort to you mum – just priceless. I was a bit of a scowler too as a young girl – I remember my nana always reciting that irritating poem – “There was a little girl who had a little curl, right in the middle of her forehead.When she was good, she was very, very good. But, when she was bad, she was horrid.” Hearing that always felt like adding fuel to the flames. And so fun to learn that you’ve got Spanish blood in you! I lived in Madrid for many years so my querida Espana holds a special place in my heart. Pingback: Oppositional Q haiku | My Haiku Year: Keeping true to 5-7-5 syllable structure + a juxtaposition each day!